The fake sugar in diet sodas teases your body by pretending to give it real food. But when your body doesn't get the things it expects to get, it becomes confused on how to respond. 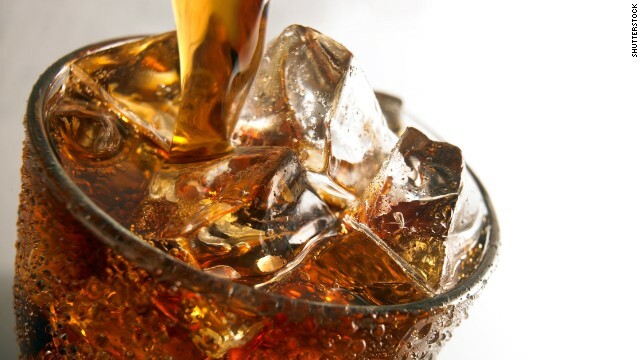 While the studies they reviewed only looked at diet soft drinks, the researchers suggest that this could apply to other products that contain artificial sweeteners as well. Video: Are diet sodas dangerous to your health? Diet soda drinkers also tend to pack on more pounds than those who don’t drink it, the report says. “Research shows that sweet taste can increase appetite and the regular consumption of the high intensity sweetness of artificial sweeteners may encourage sugar cravings and dependence,” says CNN diet and fitness expert Dr. Melina Jampolis. The artificial sweeteners also dampen the "reward center" in your brain, which may lead you to indulge in more calorie-rich, sweet-tasting food, according to the report. The American Beverage Association says the report was "an opinion piece, not a scientific study." “Saccharin was one of the first commercially-available artificially sweeteners, and it’s actually a derivative of tar,” says Swithers. Even natural sweeteners like Stevia, which has no calories and is 250 times sweeter than regular sugar, are still processed extracts of a natural plant and may have increased health risks. “Just because something is natural does not always mean that it is safer,” says Jampolis. There more studies and research that need to be done. But in the meantime, experts say: Limit consumption. ps......the diet co for the blues/pink and yellow packs all said the same thing..............NO, NOTHING IN OUR DIET SUGARS ARE UNHEALTHY...............YEAH RIGHT........ITS THEIR zillion dollar business......they don't care either. Superb blog! Do you have any suggestions for aspiring writers? I’m planning to start my own site soon but I’m a little lost on everything. Would you recommend starting with a free platform like WordPress or go for a paid option? There are so many options out there that I’m totally overwhelmed .. Any ideas? Thank you! Thrilled I stumbled upon this! Simply wish to say your article is as astonishing. The clearness in your post isjust spectacular and i could assume you are an expert on this subject.Well with your permission let me to grab your RSS feed to keep updated withforthcoming post. Thanks a million and please carry on the rewarding work. Actually can you not get married in a ceremony but not sign the register thus allowing you to indulge in polygamy since the signing the marriage register is what is binding not the actual song and dance ceremony? That way you can have your polygamy cake and eat it? thank you.His Secret Obsession . Awesomely done write-up. I certainly love this website. Continue the good work! Awesomely done write-up. I surely appreciate your site. Stick with it! Amazing blog! Do you have any hints for aspiring writers? I’m hoping to start my own website soon but I’m a little lost on everything. Would you propose starting with a free platform like WordPress or go for a paid option? There are so many choices out there that I’m completely confused .. Any recommendations? Bless you!
" I have learn some just right stuff here. Certainly worth bookmarking for revisiting. I surprise how a lot effort you set to make this kind of wonderful informative web site. " Suggested reads includeNikki Nichols' Frozen in Time: The Enduring Legacy of the 1961 U.S.|You can avoid such a scenario by getting a pair of shoes online. And the reason why we are still in the fight which is that we have taken nine from twelve in these f.
Thank you so much for being the guide through this section. I loved this post very much and most of all I loved reading the way you taken care of the issues I considered to be dubious. You are commonly fairly kind to site visitors take delight in me and facilitate me in my living. Thanks a lot. I'm really enjoying the theme/design of your blog. Do you ever run into any web browser compatibility problems? A small number of my blog visitors have complained about my blog not operating correctly in Explorer but looks great in Opera. Do you have any ideas to help fix this issue? I;m not a soda fan. But I actually am into different juices and teas. They are definitely organic, better for your digestion and it eliminates the gassy feeling.